NOS E-Liquid offers a refreshing take on vaping to truly kick your taste buds into gear. 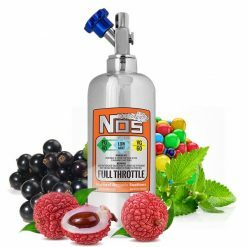 Expect full throttle flavour with every vape from NOS, without compromise on cost or quality. 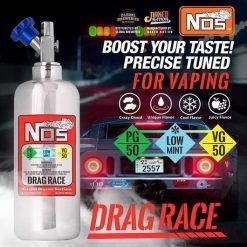 Developed in Malaysia, the cool variety of NOS E-Liquids can easily be found in the list of market leaders. 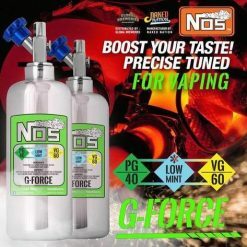 G_Force has proved popular time and time again, offering vapers hints of berries, fruit and grape with every vape. You’ll also experience a note of Menthol, perfect for an extra cool blast. Drag Race brings lychee to the mix in a unique sweet blend, or perhaps a lychee, blackcurrant, bubblegum flavour is more your style then look no further than Full Throttle.